A Splitter transformation is a transformation that creates one or more subsets of a source. You can also use it to create one or more copies of a source. You want to select two or more sets of rows from a source table and write each set to a different target table. From the Data folder in the Transformations tree, select and drag a Splitter transformation and drop it in the empty job on the Diagram tab in the Job Editor window. Select and drag the source table from its folder and drop it before the Splitter transformation on the Diagram tab. Drag the cursor from the source table to the input port of the Splitter transformation. This action connects the transformation to the source. Because you want to have permanent target tables to contain the output for the transformation, right-click each of the temporary work tables attached to the transformation and click Replace in the pop-up menu. Then, use the Table Selector window to select the target tables for the job. 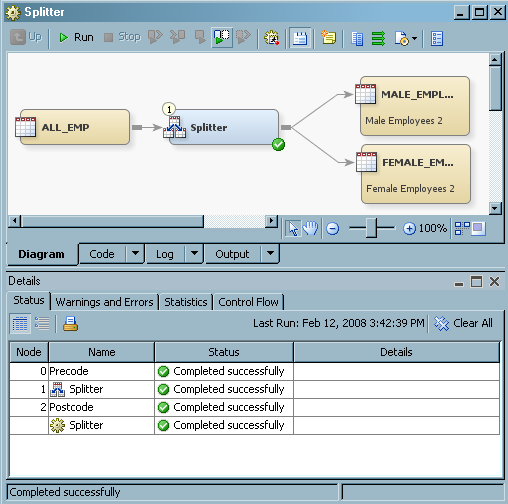 The target tables must be registered in SAS Data Integration Studio. The following display shows the sample process flow. In the display, the source table is named ALL_EMP and the permanent target tables are named Female Employees 2 and Male Employees 2. In the Job Editor, open the properties window for the Splitter transformation. Then, click the Row Selection tab. The Target Tables field displays the targets that have been dropped on the current Splitter transformation. (Male Employees 2 and Female Employees 2 are the target tables in the sample job.) You must define unique selection criteria for each target. Click the name of the first target table in the Target Tables field. The first target table for the sample job is Male Employees 2. Select the Row Selection Conditions in the Row Selection Type field. Note that the Subset Data button is activated. 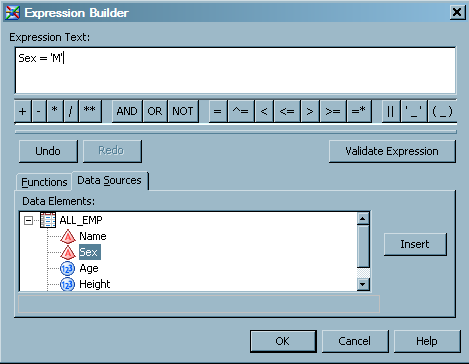 Click Subset Data to display the Expression Builder window. The following display shows the completed Row Selection tab for the first target table in the sample job. Perform the row selection conditions for the remaining target tables. In the sample job, the remaining target table is named Female Employees 2. Click OK to save the selection criteria for the target tables and close the properties window for the Splitter transformation. You have defined a job that selects rows for female employees and writes the rows to the target table Female Employees 2. The job also selects rows for male employees and writes the rows to the target table Male Employees 2. To view the target table, right-click the target and select Open. 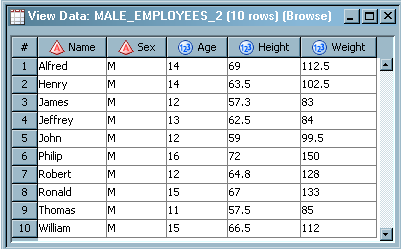 The following display shows the data for the Male Employees 2 target table in the sample job.